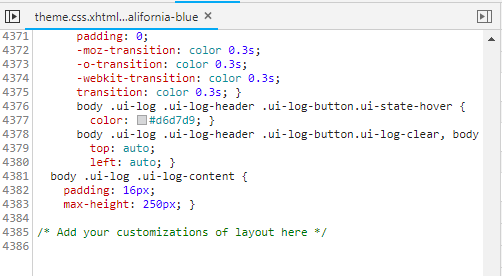 How to change layout the components in the theme? I need to modify the layout the component right-sidebar. I have a question about compile scss, because used command available in the documentation is not working. Which sass version are you using? Also, do you get an error? I'm using Ruby Sass 3.7.2. I do not receive an error, but when I started the application, the change was not performed. I have a question, is which scss files to modify? Is there a complete layout documentation different from the one displayed on the site? It tells you how to make the changes and how to use the specific components of the layout. I make modifications to the _theme_styles.scss file and compile with sass, but in the application the changes do not appear. Can you explain why? Could you please attach your codes in _theme_styles.scss? I created a class to set the padding of some panel to a certain screen. But when I start the application the generated theme.css file is not with the changes I put in _theme_styles.sccs even after compiling with sass.